← How to convert Word to PDF via command line? TIFF or TIF (originally standing for Tagged Image File Format) is a file format for storing images, popular among graphic artists, the publishing industry, and both amateur and professional photographers in general. 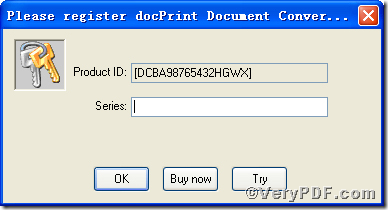 Follow the description of usage of docPrint Document Converter Professional; you will learn how to print txt to tif file. It has two divisions; one is docPrint, the other is docPrint PDF Driver. 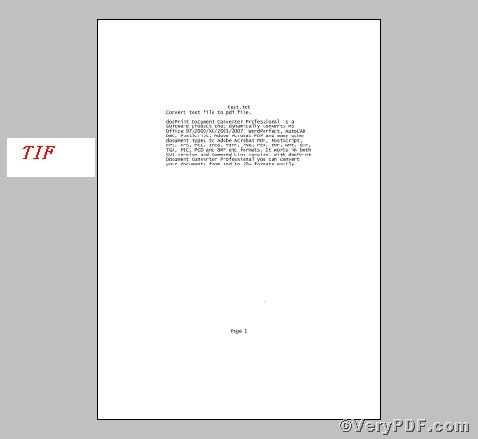 In the below part, the VeryPDF.com focuses the later one, docPrint PDF Driver and tells you how to print txt to eps file. Choose “docPrint PDF Driver”, using docPrint PDF Driver to print txt to tif. Save in output file, saving tif file in a place where you can find obviously. Name output file, naming tif file as the name you like. Select a a format for output, tif, there are several formats for you to choose, in this article, tiff. This picture tells you the printing txt to tif proves to be successful. Overall, the docPrint PDF Driver is effective in printing txt to tif. Thanks for your reading in advance, If you have further questions on docPrint PDF Driver, you are welcome to come into live support for help. This entry was posted in docPrint Pro and tagged docPrint Document Converter Professional, docPrint PDF Driver, txt to tif. Bookmark the permalink.